References to “Tournament” hereunder shall mean any live poker tournaments and cash games (each a “Tournament”) forming part of PokerStars Live events, such as but not limited to "European Poker Tour", "Asia Pacific Poker Tour", "PokerStars Caribbean Adventure", "Brazilian Series of Poker", "PokerStars Players NL Hold'em Championship", and/or "PokerStars MEGASTACK" (each of which shall be referred to as an “Event”). References to a “Group” means the relevant Event Company together with its subsidiaries and any holding company of that Event Company and any subsidiary of such holding company and any company associated with the group of companies known as The Stars Group. 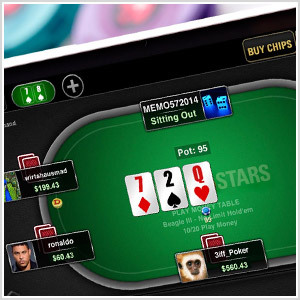 It may also be necessary for us to process your personal information where it is necessary for the performance of a contract (such as the PokerStars Live Terms and Conditions) or in order for us to comply with our various legal and/or regulatory responsibilities, including, but not limited to, complying with the conditions of applicable gaming licences (whether held by us or some other third party in whose venue the Event is held) and complying with any anti-money laundering legislation. General Disclosures: In addition to the specific examples of disclosures listed above we may disclose your personal information to our employees, employees of other companies in our Group, our agents and to third party service providers who use your personal information to provide Services to us in respect of you being a user of the PSLive Service. Cookies are text-only strings of information that are downloaded to your personal desktop, laptop computer or mobile device (each a “Device”) when you visit a website. They are then sent back to the originating website on each subsequent visit, or to another website that recognises those cookies. Please click here for information about what cookies are and what they do.